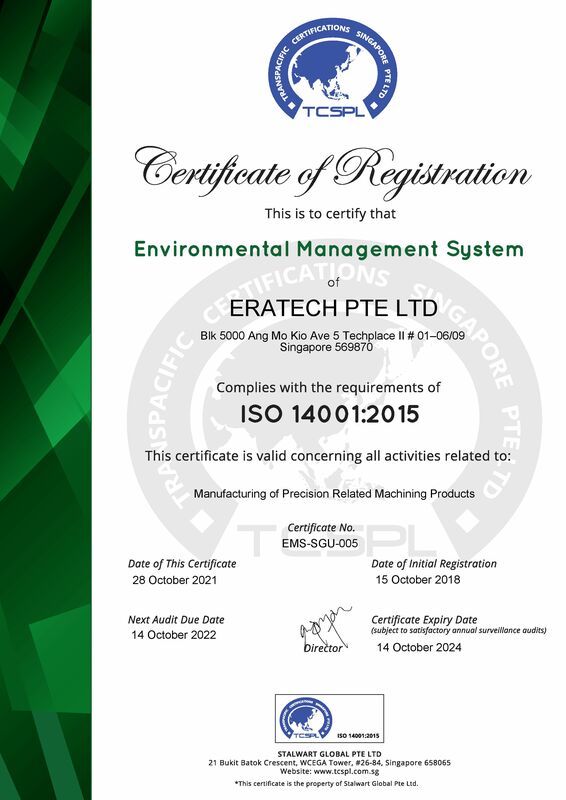 ﻿ Welcome To Eratech Pte Ltd.
Eratech Pte Ltd (EPL) is located in Singapore and is formed from the tooling company "Eratech Industrial Engineering ( EIE )" founded in 1983 by Mr. Eddie Koh. As of April 2007, we changed our name to Eratech Pte Ltd ( EPL ) to reflect the branding, development & diversification of our business. This coincides with the establishment of our sister company Eratech Automation Pte Ltd in 2006 to service specifically the customised automated machines industry. Under Mr. Eddie Koh's leadership, EPL is a leader in precision machining & turnkey manufacturing services and develop a broad base of engineering expertise and manufacturing know-how which enables EPL to successfully undertake and complete projects that are complex and technically demanding. EPL’s emphasis on its core values, continuous improvement programme, and strict compliance with its AS9100 & ISO 9001:2008 as well as ISO 14001:2004, Quality Standard ensure that all its customers continue to be satisfied with its quality products and differential value-added services. 2007 5th Phase Upgrading of major manufacturing machine and equipment up to SG $2,000,000. 2008 Invested S$ 1.2 Million in 6 units of FANUC Robot Drilling Machines and 3 units of MAZAK CNC Lathe Machines. 2010 Attainment of AS/EN/JISQ9100 and ISO14001:2004 Certification. Acquired one unit of FUNAC Robot Drilling Machine, one Unit of Moriseiki NVD 1500 DCG and one unit of Mitsubishi Micro V1. Also achieved annual sale revenues over SG $ 5,700,000. 2012 Acquired one new CNC Milling machine Mitsubishi Micro V1-5x, one CNC Milling machine YASDA YMC430 VII and one CNC Turning machine Takisawa TCN-2000Y-T12,L3. 2013 Participated at MTA - METAL ASIA 2013 as Exhibitor and acquired one new CNC Milling machine YASDA YMB950V Ver III there for 6th Phase Upgrading of major manufacturing machine and equipment up to SG $1,000,000.